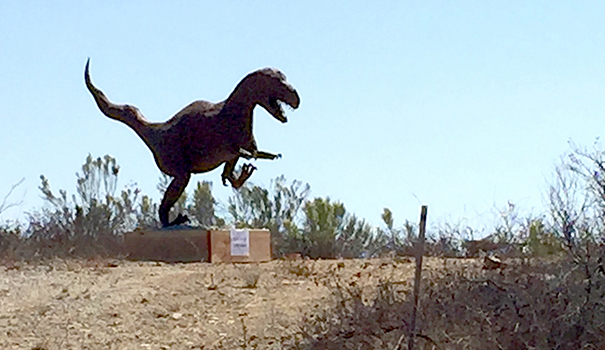 That’s the way Phair described how he came across the sculpture of a Tyrannosaurus rex that now sits atop a property he owns and will soon be developing, located off Eastridge Drive in La Mesa. And so do a lot of other people. After the dinosaur was installed at the property, news organizations reported on the sculpture that appeared somewhat mysteriously on the vacant lot. La Mesa Courier received a letter and photo from nearby resident Alice Hobson requesting “some investigative reporting” on her new neighbor the dinosaur. As news about the recent sculpture got out, curious people came to visit the new art piece. Nancy Faulkner saw an article about the T. rex in the Union-Tribune. She said the sculpture reminded her of others she had seen in the desert. And she is right. Phair and his family purchased the T. rex, which they named “Toby,” from artist Ricardo Breceda, known for his metal sculptures of animals and dinosaurs. Many of these are displayed in places like Borrego Springs. The Breceda dinosaur sculpture is the first structure to be placed on the 10-acre property that Phair’s company is transforming into La Mesa Summit Estates, a new subdivision project of around 30 high-end homes that was given its final green light by the City Council on Sept. 11. The project will be a mix of four- and five-bedroom houses — mostly single story — with porches that highlight the views. “Every single house has a view of either the ocean, Downtown San Diego, Point Loma, Cowles Mountain, the backcountry mountains or Mexico — every lot has a view,” Phair said. 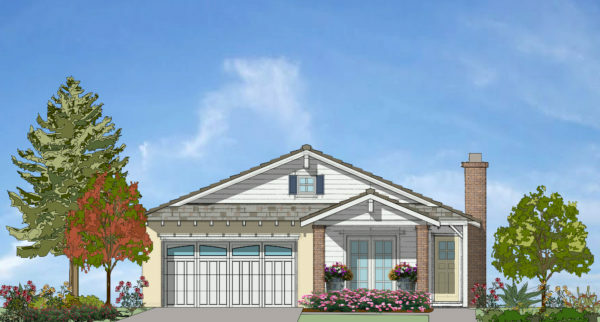 The homes will be in a private community on a gated street. There will also be a park built in the neighborhood, where the dinosaur sculpture will be installed permanently. But fans of Toby the T. rex do not have to worry about being shut out from enjoying him — the project calls for the park to have an access point that is open to the public. In addition to building a park for the neighborhood, the Summit Estates project includes money for improving pedestrian safety at the intersection of Eastridge Drive, Yale Avenue and Murray Hill Road through enhancements that include parallel curb ramps, rapid rectangular beacon signage and continental crosswalks. “There are multiple schools in the area, including Helix High School, and a significant amount of pedestrian traffic is walking to and from school and that was noted as a needed enhancement in the area,” said La Mesa senior planner Allyson Kinnard at the Sept. 11 meeting. Mayor Mark Arapostathis thanked Phair for including the enhancements to the Summit Estates project, even though the development site is several blocks away from that intersection. In addition to the pedestrian enhancements down the street, Phair also plans on donating some resources on another project that is off site of the Summit Estates development. He and Julie, his wife and partner in the Phair Company, have been meeting with the committee tasked with developing MacArthur Park about how to contribute to building a community garden there. The Phair Company’s community-minded approach to developing Summit Estates was praised by City Council members as they voted to approve the project. Colin Parent expressed his gratitude to Phair for involving the community and making concessions on the project to address neighbors’ concerns. “We received an enormous amount of correspondence related to this project reflecting the tremendous amount of community outreach,” he said. Phair also had praise for the city of La Mesa. “I have developed a lot of projects around San Diego County, probably 40 or 50, in probably most jurisdictions and municipalities and I want to thank the planning staff. They have been very professional, very cooperative, very responsive and that makes it easier for us as developers,” he said. 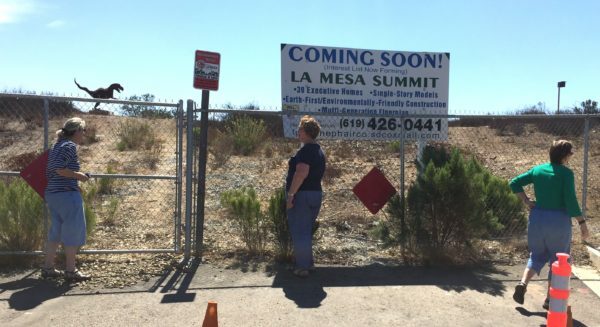 Phair said the experience with the city in developing the Summit Estates project has made him interested in future projects in La Mesa. And the city planning department is not the only reason he may want to build here again.